Eric Emin Wood/Town Crier FAILURE TO COMMUNICATE: Mike Ormsby addresses the audience at a community meeting on June 12 about the proposed use of green space in front of the North Toronto Community Centre as a Metrolinx construction storage area. The city will be looking for the best place for Metrolinx to store construction equipment on Eglinton Avenue after a plan that would eliminate about 25 trees in front of the North Toronto Memorial Community Centre met harsh resistance from residents. 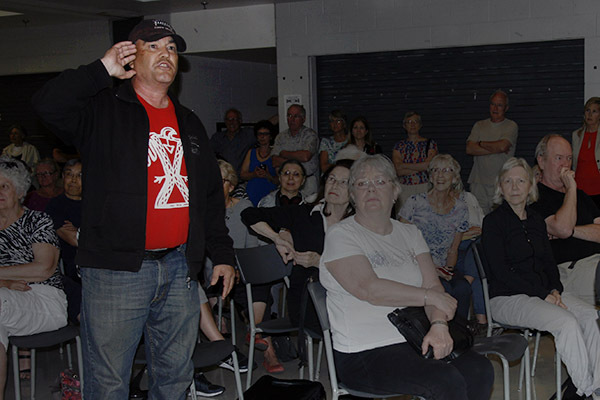 Galvanized by a campaign by the Eglinton Park Residents’ Association, more than 120 residents packed a room at the centre on June 12 to discuss the plan. “I’m First Nations. One thing we know about is when we’re not consulted, and you have not consulted anybody that I can see for this project,” Mike Ormsby said, to thunderous applause. Metrolinx spokespeople Jamie Robinson and Franca Di Giovanni told the meeting that building the nearby Avenue Road LRT station will require a large underground construction site for crossover track where trains can turn around. This will require more equipment stored in the area. “The amount of real estate excavation that needs to take place is much, much greater than any other station,” Robinson said. Ward 16 Councillor Christin Carmichael Greb, who organized the meeting, said she expected to hear opposition to the proposal, noting that while area businesses were consulted extensively, residents were not. Carmichael Greb said nothing would be decided until a working group was established — before or soon after the next council meeting on July 12. The Eglinton Way BIA, Eglinton Park Residents’ Association, Metrolinx, Crosslinx, and city staff would all be involved, she said. “I’m trying to keep the conversation going so that we can come up with a solution that will work for everyone,” Carmichael Greb said. Robinson told the meeting Metrolinx would be happy to collaborate with residents to mitigate their concerns wherever possible. “Is it a done deal? The short answer is no. Have we got approval from the city of Toronto for the park? The answer’s no,” Robinson said to loud applause. If they got approval to use the park, they would have to seek permits to remove the trees, he said. One resident asked why the site’s construction equipment couldn’t be stored in the concrete area behind the centre. Another asked why Metrolinx couldn’t use the nearby vacant stores. And another asked why part of Eglinton Avenue West couldn’t be closed, since traffic would be snarled at nearby Yonge Street anyway. Di Giovanni answered some questions more directly than others — but also emphasized that with a project of this size, there would have to be compromises, and no single solution would satisfy everyone. They also emphasized that while the construction staging area was expected to encompass around five percent of the land’s park space,it would not affect the community centre itself, including its driveway, entrances, and programs. Michael McClellan, a representative of the city’s Urban Forestry division, elicited some of the audience’s loudest gasps when he mentioned that Metrolinx had originally estimated its plan would remove 37 trees, but had lowered its estimate to 25 trees. He noted a number of trees in the area appeared to be about 60 years old. While eliminated trees would be replaced at a rate of three to one, new trees would have a diameter of six to seven centimetres.